The University of Melbourne is planning to reduce emissions through on-campus energy projects by 20,000 tonnes of carbon per year. The University of Melbourne is aiming for complete carbon neutrality by 2030, while rejecting carbon offsets as the best way forward. A recent Sustainability Plan has committed the University of Melbourne to achieving carbon neutrality before 2030 and zero net emissions from electricity by 2021 through a suite of built environment and other measures. Allan Tait, the University of Melbourne’s chief financial officer and chair of their Sustainability Executive Group, says the plan is the first-of-its-kind to combine all of the university’s activities “into a cohesive, all-encompassing plan” that moves beyond simple carbon offsetting. By 2020, the university will aim to reduce emissions through on-campus energy projects by 20,000 tonnes of carbon per year, while reducing mains water usage by 12 percent. Other measures the university is adopting include a “no net loss” to tree numbers on campus and monitoring of harvested water usage. “Our commitment is bringing together policy leaders, industry and academic experts, and convening them to drive public debate and policy development. That is something that no other university in Australia has done at this stage. We are working strongly in the research field in partnership with a range of organisations, including those involved in fossil fuel production, and we have got over a thousand researchers and over $200 million per annum spent on sustainability-related research,” Tait said. Using the Green Star rating system to guide the environmental standards of major projects, the university has used passive design approaches, complemented by efficient active systems, to meet its commitments. The plan notes a plethora of sustainability standards, a commitment to building lifecycle analysis, the integration of sustainability commitments and applying a “zero emissions-ready” approach to campus development projects. However, the 40-page document includes almost no detail as to what the university will look like, how it will change, or how its staff and students will engage with its buildings and campuses. 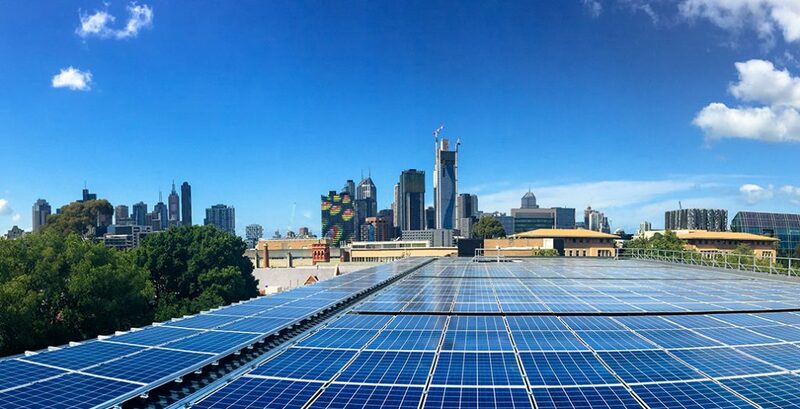 The University of Melbourne has obtained funding from the Clean Energy Finance Corp for projects with a longer payback period, and entered an arrangement with the City of Melbourne and other organisations to develop renewable energy sources that will reduce their dependency on conventional energy sources by at least 10 percent. As part of their plan to mitigate climate change risk in the investment portfolio, the university is also developing a sustainable investment framework with its staff in the Faculty of Business and Economics, in partnership with the Melbourne Energy Institute, the Oxford Martin School at Oxford University, UBS and Harvard. Tait told Foreground that while the university intends to reduce its carbon emissions, it will work with fossil fuel producers to develop solutions as part of its divestment approach. “We undertook an internal stakeholder mapping exercise to determine the depth of our relationships with the Carbon Underground 200 list. The university has strong relationships with research partners such as BHP Billiton and Rio Tinto and continuing these relationships where appropriate is part of our approach to contributing to mitigating climate change impacts,” Tait said.